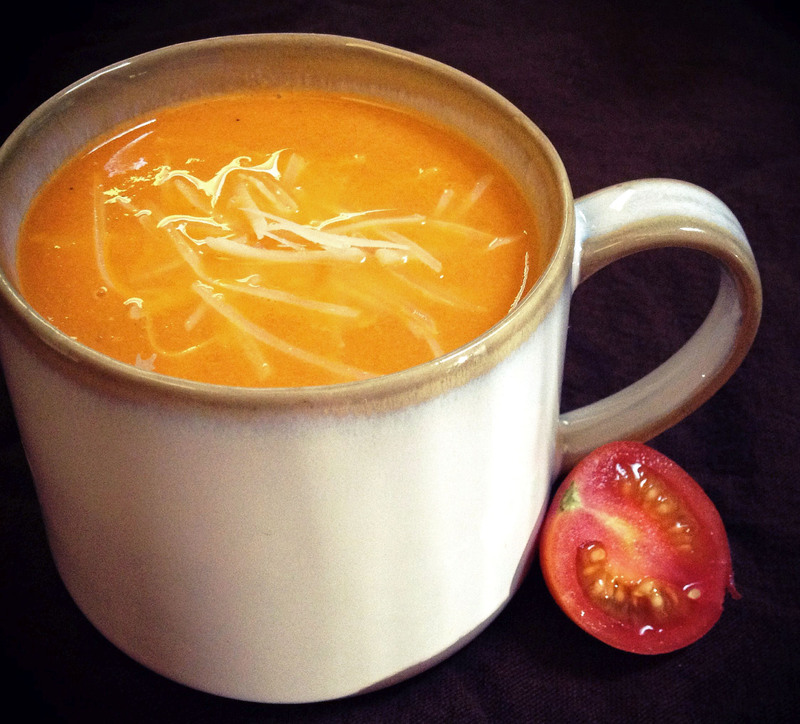 Roasted Tomato Soup, finally a hot and hearty comfort food that’s mostly healthy. Okay, it’s healthier if you don’t add the cream at the end, and it’s quite good without that. We had our first frost frost of the year this weekend, which means all the last tomatoes have been picked and it’s time to use them up. I’m partial to it with crackers or a grilled cheese sandwich, and garnished with a small handful of thinly sliced fresh basil leaves. Tomatoes are available year round in most grocery stores, so don’t let the season limit you. Use any kind of tomatoes you can get your hands on – big, little, heirloom, whatever. The flavor of the soup will vary by the tomatoes, as any veggie-focused meal does, so if you can get a variety that’s going to bring the best depth of flavors. The only kind I suggest limiting is cherry tomatoes or other tiny ones since it will take a very long time to peel and seed those. Or you could just throw in the peels and seeds, up to you. I’ve added some new tags to the site to make it easier for those with dietary restrictions to find recipes, such as diabetic-friendly, dairy-free, and gluten-free. I have a lot of food allergies and I know how hard it can be to find good recipes or to figure out what exchanges can be made so a recipe will still work and be tasty, so here’s hoping the extra tags make your lives a little bit easier! I have also been exploring new local goodies, and discovered fresh tomatoes (among many other excellent foods) at Hilger Family Farm. If you’re near the Fort Wayne area, check them out! Wash, core and cut the tomatoes into halves. Optional but recommended, scoop the seeds out of the tomatoes and either prepare the seeds for saving for future planting or throw them out. (the seeds can be a touch bitter and don't blend well). Spread the tomatoes, garlic and onions onto a baking tray. Skin side up or down doesn't matter. Drizzle with olive oil and season with salt and pepper. Roast for 20 to 30 minutes. If you would like to peel the tomatoes, now is the time, as the peels should slip right off. Remove roasted tomatoes, garlic and onion from the oven and transfer to a large stock pot. Add the chicken stock, bay leaf, and butter. Bring to a boil, reduce heat and simmer for 15 to 20 minutes. Remove the bay leaf and stir in the sugar if desired; it's to cut the acidity so it may not be needed depending on your tomatoes. Use an immersion blender to puree the soup until smooth. Return soup to low heat and add cream, if desired. This entry was posted in Dinners and tagged diabetic-friendly, fall, gluten-free, soup, summer, vegetarian.